Bitter Betty Blogs: DIY Couture Give Away and The Cloak I Made in an Afternoon! DIY Couture Give Away and The Cloak I Made in an Afternoon! Recently, after I sold out, I was contacted By Rosie Martin at DIY Couture. She asked if I'd like to check out their books and I said "Yes, Please! Shall we do a give away!?" Of Course, she said yes, or the title of the post would be totally different. I got her first three books in the mail so fast. SO fast, all the way from England. It totally blew my mind. They are great. Well written step by step instructions and full of excellent graphics so if you learn better from reading, or from looking at diagrams, they have you covered. It's basic sewing without patterns; just using geometry and borrowing lines from garments you already love. It works great. I made a lined cloak in less than a day. just a nice summer wrap. This came out so much better than the caplette I made from a pattern... In fact I may remake it, using this system. The books look great and there is a bit of surprise art in the back that gives them a fun Zine-like vibe. So here's your chance to comment and win a set of these 3. Make sure I can get a hold of you, (all you anonymous commentators, email address please, or a code name...something! ), and a link back to this post gets you a second entry. Just be sure to mention your intention, so I can come see your sweet little blogs. I found some fantastic new reads the last time we had a give away! Not a blogger? A Facebook link will work too! The 4th of July Weekend has me hoppin', so I'll draw the winner next Tuesday, July 6th! Good Luck, all you wannabe DIY Couturiers! And a Big Thanks to Rosie, for sharin' the love! Gotta Fly Like A Superhero! I have some old books from the 70's that are supposed to do this - but I love these designs, would love to sew half of them! These books look great! What a fun giveaway! I would love to win these booklets. Great cloak by the way! It looks similar to a BurdaStyle pattern I've been wanting to make, but I'm too lazy to cut and tape pages together. Your coat looks gorgeous, and - of course - I would love to win these books! That is a fantastic cloak! I'd love to win these, the skirt one looks especially great!! Oh Betty, I've been looking for a simple cloak pattern all year. Thanks for hooking me into DIY couture. I would love to win the 3 books, but i really want to buy all of them!! Recently took a draping class (at the now defunct Crafters Studio) and had fun creating from my measurements. Much more fun (and fitting) than using a pattern! oh betty betty, i just feel i need a cloak now after seeing how dazzling one looks on yoU! Thanks for passing this on.. I'd love to give these books a try. I never learn well from written instructions, and there's always something I want to change on any pattern. Thanks! I love what you've made! Great choices! Love the flair you always display in your poses, btw. ooh a new UK sewing company?? Yes, please!! I love the idea of a sewing book without patterns! Count me in! Sounds like a great combo, no patterns but good instructions and pictures. Sign me up please! Love the cloak, looks perfect for a foggy evening at the beach. I love to try new patterns and these are definitely new to me! Crossing my fingers I win! Love the patterns! With a housefull of girls they will be made...and made...and made! I hopped over and checked out the DIY Couture site - very clever stuff. Please add my name to the "hat"! These might just might be the books to get me back into sewing. I just started sewing again, doll clothes to begin with (sturdy, lacy underthings and easy tops so far), and this could help get me started on making things for myself. And the capelet, well, you did a splendid job. It looks beautiful. So motivating to see you dash this off in such short time. I am always interrupted and am hesitant to start anything more complicated than a napkin. 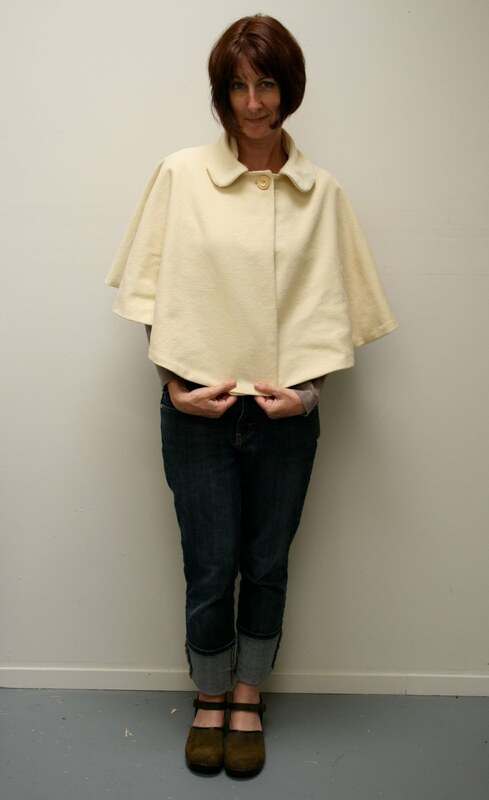 The cape is truly lovely and it would be fun to add some embroidery or applique. I'd love to win your creations. Thanks for having this drawing.